I’m not big into condiments, meaning I hate ketchup (seriously), only like one kind of mustard and unless it is in some sort of chicken or tuna salad and in a small quantity, won’t touch mayonnaise. I’m not sure if you could completely count pesto as a condiment, but considering it is dippable, spreadable and goes with many things, I’m going to say that it’s close enough – and I actually like it. I’ve made two pestos recently and liked both of them enough to share with you. The Sun Dried Tomato Basil Pesto is from the Weelicious cookbook which is one of my favorite recipe resources as of late because of the super easy, family-friendly nature of all of the recipes. 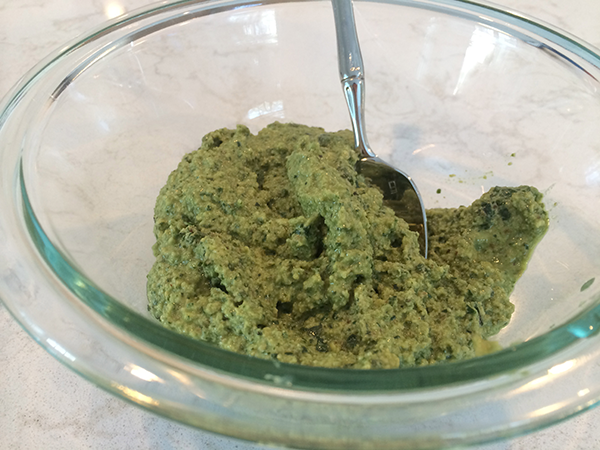 The Walnut Basil Pesto recipe is from Juiceboks (again, yes), and you all know why I’m a fan there, as I’ve shared a few recipes I’ve made from the site. I made the sun dried tomato pesto to go with this turkey meatball recipe (also from Weelicious) and the walnut basil pesto to go with pasta with shrimp and tomatoes – which is a dish I make variations of all the time. The sun dried tomato pesto was really good in the meatballs but also awesome on a veggie fritatta I made and also when mixed up with pasta as lunch. I only made enough walnut basil pesto for one dinner, but it reheated well the next day. I want to try it in a pasta salad with some veggies and mozzarella this weekend. Both recipes were super easy and I like being able to make something and use it in more than one dish – especially since working from home often means leftovers for lunch. Next time, I would probably double both recipes and freeze half the next time though, just because it is that convenient and easy. Place all the ingredients in a food processor and blend until smooth (if the pesto is too thick, add additional olive oil). *You can also place into ice cube trays and freeze then pop into ziploc bags. When ready, defrost in fridge for 24 hours or toss in with your hot pasta – tossing until it defrosts. 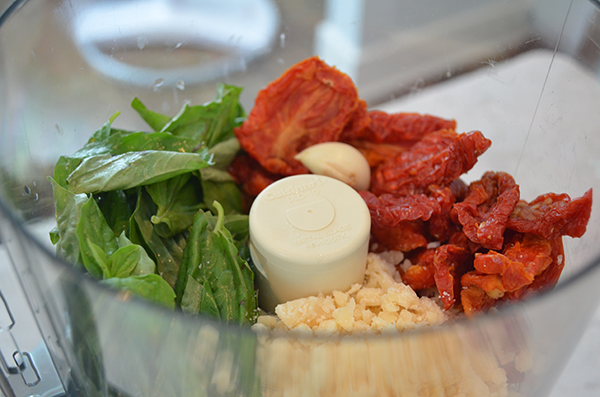 In a food processor, pulse the walnuts and the basil until well combined. Add the lemon juice, garlic and avocado and allow to process, while slowly adding in the oil from the spout above. You may have to stop a few times to scrape the sides of the bowl until well combined. Season with sea salt, to taste.